Baking soda is a versatile, tried-and-true product that you can be pretty sure your grandmother used for everything from washing clothes to unclogging drains. This natural cleanser and deodorizer has never really fallen out of fashion, but it has been largely relegated to sitting in a box in the refrigerator to ward off odors. It started to once again make appearances outside of the refrigerator when more folks became interested in avoiding chemicals and moving towards a greener, eco-friendly lifestyle. Now, many people use it to deodorize rugs and carpets, freshen laundry and scrub their bathtubs. While lots of households are using baking soda for all sorts of purposes inside their homes, many have not yet discovered how easy it is to also use it in our outdoor living areas. To get you started, here are 10 easy ways you can use baking soda to clean and deodorize your outdoor living areas without chemicals. 1. Use baking soda to clean the stainless steel in your outdoor kitchen. Make a thin paste with baking soda and water. Apply it to any stainless steel surfaces with a damp rag. Use another damp rag to remove any residue and to buff the stainless steel until it sparkles. This method is a great way to get your stainless steel appliances and surfaces clean without using expensive stainless steel cleaners with harsh chemicals. 2. Use baking soda to clean and deodorize outdoor rugs, dog beds and patio cushions. Baking soda can help remove pet accidents and can remove unwanted smells from textiles. In the case of pet accidents on outdoor rugs or patio cushions, blot the liquid with a rag, and then sprinkle baking soda on the wet spot to absorb more of the liquid. Use a damp rag to blot the (now wet) baking soda. If your pets like to sleep on your patio furniture or rugs, they are likely to begin to smell like your pets after a while. You can remedy this by liberally sprinkling baking soda onto the rugs and cushions, leaving it for several hours or overnight, and then vacuuming it up. You can use this same method to deodorize dog beds. 3. Use baking soda to clean your barbecue grill and stove. If you have a stove or barbecue grill in your outdoor kitchen, you can remove grease and clean them with a paste made with baking soda and water. This all-natural grill cleaner is a safer alternative compared to commercial grill-cleaning products, which are often full of harsh chemicals. For light cleaning, you should be able to get your grill or stove grates clean with just this baking soda-water paste and a damp rag. If there is excessive buildup, you may need to use a scrub brush to get the job done. 4. Use baking soda to clean and deodorize patio trash cans and recycling bins. If your trash cans or recycling bins need a good scrubbing, you can make a mildly abrasive cleanser by mixing baking soda and water into a paste. Use a rag – or a scrub brush for more stubborn dirt, grease or debris – to clean the bins. If your bins just need to be deodorized, sprinkle baking soda in them to remove the smell. 5. Use baking soda to keep your patio refrigerator smelling fresh. Setting a box of baking soda in the refrigerator to combat food smells has always been one of the most popular ways to use baking soda. Most of us have a box in our main refrigerators right now but might not think about also putting one in the refrigerator we have in the garage or in our outdoor kitchens. All you have to do is place an open box in the fridge and switch it out every couple of months to avoid unwanted odors. If you purchase baking soda in larger packages, you can also place a bowl of baking soda in your patio refrigerator for the same effect. 6. Use baking soda to soak up grease and spills. Baking soda can be used to soak up grease and liquid spills on almost any surface. This means that you should keep some on hand to sprinkle on spills on your patio, outdoor kitchen counters, rugs or other surfaces. If you have natural stone counter tops or a patio made from porous material (such as paving stones, bricks or concrete), baking soda can even help pull grease and other liquid stains out of the stone or other material. 7. Use baking soda to clean your paving stones, concrete or bricks. If you have paving stone, concrete or brick walkways or patios, you may find that staining occurs from things like your guests spilling wine, mold or algae growth, or keeping your container garden in one spot for too long. You can remove these stains by creating a mildly abrasive cleanser made with baking soda and water. If it is a fresh, liquid stain, you may want to sprinkle dry baking soda on it first to allow the baking soda to absorb as much liquid as possible. Once you apply your paste, you may need to let it sit for a while before using a soft scrub brush to gently scour the area. Rinse with water and repeat, if necessary. Using a baking soda and water paste is also a good way to remove stubborn sidewalk chalk. 8. Use baking soda to clean your patio furniture. 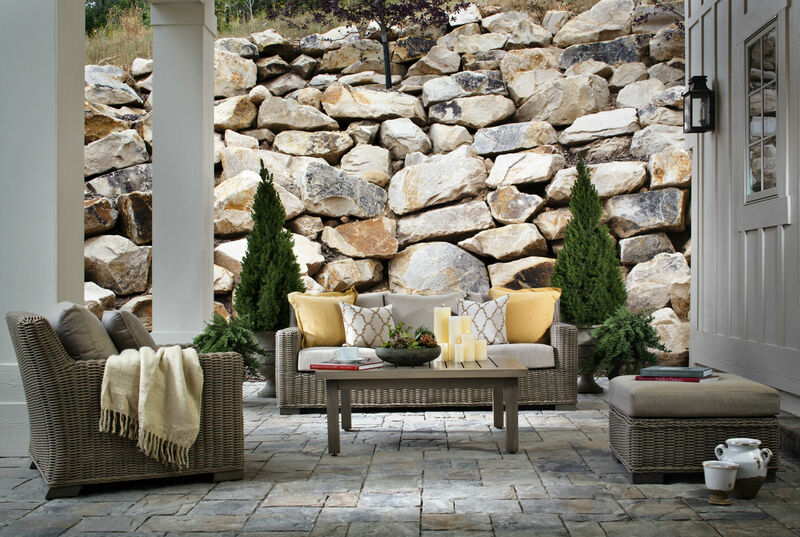 If your patio furniture needs a bit more than a light dusting, you do not have to turn to harsh chemicals that could damage the finish. Instead, sprinkle baking soda on a damp rag and use that to wipe down your chairs, sofas and tables. 9. Use baking soda to clean clay pots, fountains and birdbaths. If you have clay, porous or glazed pots, fountains or birdbaths that need a good cleaning, simply take a damp rag, sprinkle baking soda on it, and wipe down the surfaces. If there is some mineral buildup or bird droppings, you may need to switch out your rag for a baking soda-water paste and a scrub brush. 10. Use baking soda to clean toys. If you have kids or dogs, you are sure to have outside toys, and those outside toys are sure to get pretty grimy after a while. You can easily clean them and remove the gunk by soaking them in a bucket of water with about a cup of baking soda. You should be able to use a rag to remove most dirt and gunk after soaking the toys. If there are particularly stubborn spots, you can use make a paste with baking soda and water and use this mild abrasive with a rag or scrub brush. What are your favorite ways to use baking soda as a natural alternative in your outdoor living areas?